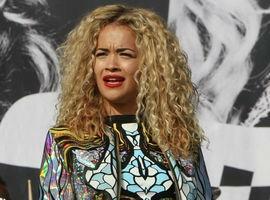 Rita Ora has had a year some of us can only dream about. A number one album, number one singles, celebrity friends and Calvin Harris as a boyfriend. Pretty impressive for a 22-year-old. She is also gracing the cover of GQ magazine this month in a stunning photo shoot. Maybe she asked BFF Cara Delevigne for modelling tips? Sporting a curly blonde barnet, she wore one of her trademark bold outfits; a matching top and bomber jacket combo with a stain glass window effect. Ora caught the eye of Jay-Z after gigging in bars around London and signed to his label Roc Nation in 2009. Releasing her debut album ‘Ora’ in 2012, it spawned three number one singles including ‘R.I.P’ and made Ora the artist with the most number one singles in the UK singles chart in 2012. Following a nasty break up from Rob Kardashian she’s since hooked up with Scottish mega DJ and producer Calvin Harris. She’s also never too far away from “wifey” Cara Delevigne. Move Over Lea Michele And Cory Monteith! Glee's Blake Jenner And Melissa Benoist Engaged?